According to USA Today’s Ad Meter, which ranks Super Bowl ads by consumer ratings, “The 100-Year Game” won the night. The ad featured players from six generations chasing a football that fell off a cake. The spot featured superstars from past and present and even included Sam Gordon, a female youth football player, and Tyler “Ninja” Blevins, a Fortnite champ. 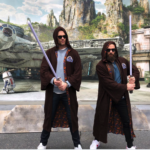 In their post-Super Bowl celebrations, Tom Brady and Julian Edelman look like they are enjoying themselves at Disney World. Check out their lightsaber skills. James Harden’s scoring streak continues after scoring 44 points in the Houston Rockets win over the Phoenix Suns. Harden now has 27 games with 30-plus points and 20 games with at least 40 points this season.